As soon as I was PHD's Challenge this week for a grayscale a water marble popped into my head. Not soon after I knew I wanted to use a hot pink. The only one in my collection is Sinful Colors Fusion Neon. I did a BC and then one coat of Sinful Snow Me White. I've been using the tiny dixie cups for my water marbling, and while they work well there's not a lot of design area to work with in the cup. I dug through the cupboard and found a Malibu Rum wide shot type plastic glass that worked soo much better! I used Savvy in Ebony Black, Sally Hansen Xtreme Nails in Gunmetal and Sinful Snow Me White for the marble. This is by far the best water marble result I've gotten - hooray! I then decided to do a free hand chevron tip with the Fusion Neon. There were some great entries, check them all out here. 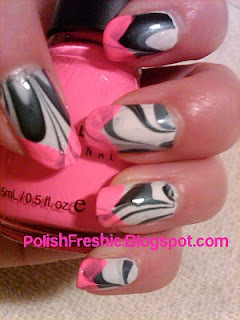 Nice water marble. I'm too afraid to try it, I heard the clean up is extensive. Iris - this is my fourth try and I feel like I've finally got it down! I would check out My Simple Little Pleasures tutorial videos - she's in my blogroll, she's the master! I watched all of hers and gave it a go. Thanks Beata! Use scotch tape, after you peel it off, use Q-tips and a hard eyeliner brush to get rid of the excess. If you take more time to tape it's even less work! That looks incredible. Really retro! Your marbling is soooooo good!!! I love it with the pop of pink you added later too. Awesome marbling! I have yet to venture into marbling. I'm afraid :P. All these entries are making want to try it though. Very pretty! I like how you can see the marbling through the pink tips. Sammersaus - Thanks so much!